Off-grid rural villages in emerging markets must usually resort to solar panels and batteries, often donated by non-profit organizations and charities. The problem, however, is that charitable handouts aren’t sustainable and don’t scale. At the same time, people can take out small loans to buy solar products, but access to credit is low and the products themselves comparatively expensive. A self-supporting solution would scale solar in these countries and increase the roll-out speed. There are 1.2 billion people around the world who do not have access to electricity. The market spend on distributed solar and off-grid appliances is estimated to reach $50B annually, so it’s not a small space. A few years ago San Francisco startup Angaza created Pay-As-You-Go (PAYG) software for Androids, which allowed someone to buy into a solar device, like a lantern, pay it off incrementally, and thus get off using polluting fossil fuels for lighting and power. Angaza has now raised a Series B round of $10.5M to scale its innovative solution. Laurene Powell Jobs’ Emerson Collective led the ground and was joined by Rethink Impact, Salesforce Ventures, Social Capital, and the Stanford StartX Fund. It previously raised a Series A funding of $4 million. The new round means an Angaza has raised $16m to date. In the last two years, Angaza has reached 2 million new solar users in 30 countries. How did they scale so fast? Most of the 1.2 billion off-grid consumers across Sub-Saharan Africa, Asia, and Latin America live at the “bottom-of-the-pyramid,” which means they don’t have enough cash at any one time to purchase a modern energy device outright. Every year this consumer base literally burns over $30B of their hard-earned income on candles, disposable batteries, and kerosene to light their home and power their devices. That means they are stuck in a perpetual cycle of poverty as this often equates to up to 20% of their income. By offering a Pay-As-You-Go option for solar power, off-grid families can purchase clean, reliable electricity and products in small, affordable increments. Angaza’s cloud-based webportal and Android application is optimized for low-end smartphones used in these countries, and allows distributors to scale their operational capacity. It’s basically a game-changer technology. When the distributors of solar energy lighting and battery charging products embed Angaza’s metering technology within the product they can ensure that the product only works if the customer has pre-paid for energy. Distribution businesses that offer these ‘solar product loans’ to consumers are able to monitor their sales and track payments in real-time using Angaza’s suite of software tools. 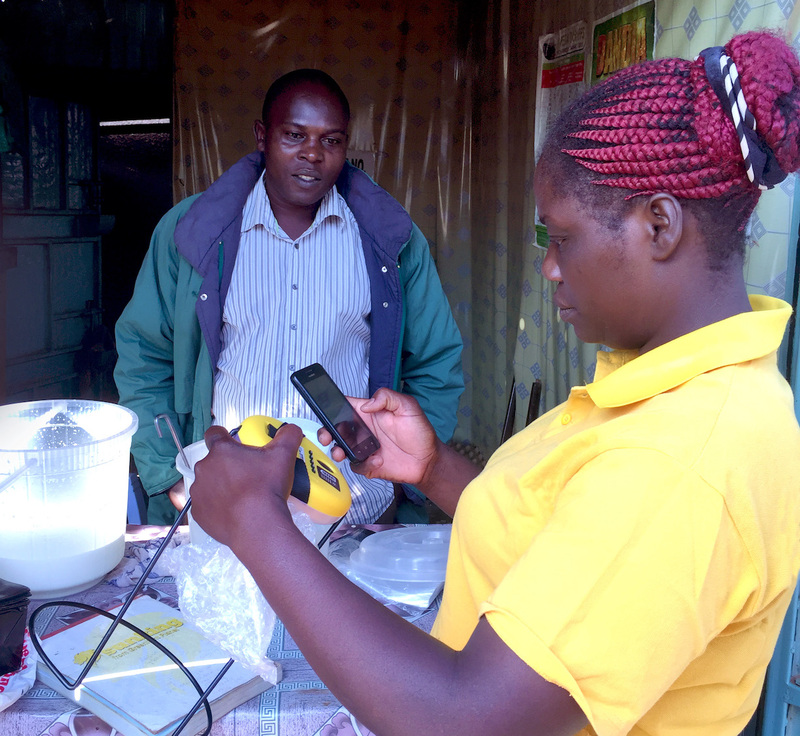 There are now solar product distributors in over 30 developing countries using Angaza’s technology platform to sell Pay-As-You-Go energy devices, enabling over 2 million off-grid people to make the switch from kerosene to solar energy. This encompasses portable solar lights but can scale up to high-wattage solar home systems that can power appliances like TVs and refrigerators. There are a number of vertically integrated (B2C) Pay-As-You-Go solar companies which sell financed solar home systems. But Angaza’s B2B approach enables them to sell their technology to third-party manufacturers and distributors at a fraction of the cost it would take for them to develop it in-house.